Rows of open faced books encased, illuminated, and suspended in the dark –that’s what you see before you look inside the books on display or as you approach doors leading into the galleries at the Crossing Borders exhibition of illuminated medieval Hebrew, Islamic, and Christian manuscripts on loan at the Jewish Museum from the Bodleian Library at Oxford University. I wasn’t expecting anything quite so exciting. Not content, the first thing is form, the mix of ambient darkness and artificial (non-natural) illumination, two rows of book per long case, one case behind the other. 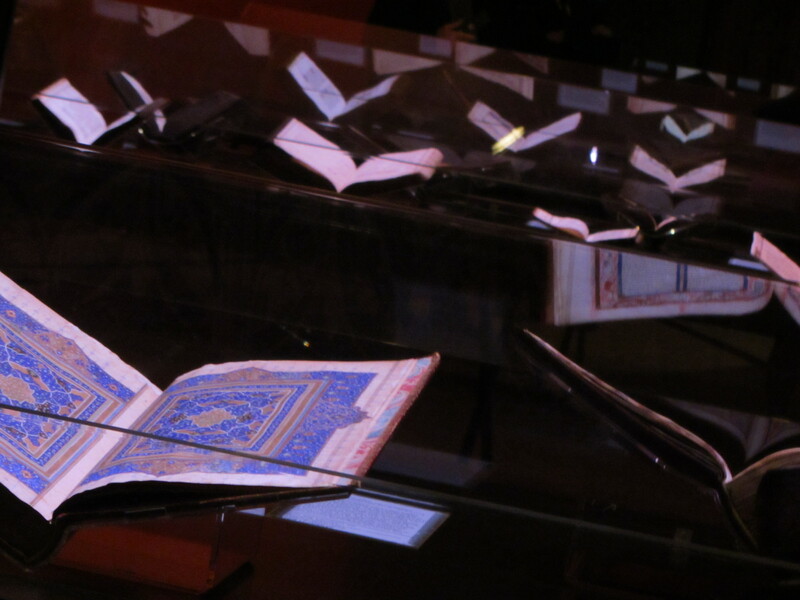 The open, floating books are winged, bird-like, angelic, the darkened red walls of the surrounding space corpuscular. Even before you look to examine any one individual book, the exhibition design-work has already made its visual impression, left its mark. I’m sure I’ve never seen anything like it, this “fraternity” of books and the techno-spiritual form in which they are shown and to which they are given. This entry was posted in uncategorized and tagged Jewish art, Museums & Galleries, object, parks & gardens, technology. Bookmark the permalink. Do I repeat myself? So I repeat myself! This is out of this world! It conveys what Cavell calls “inordinate knowledge,” knowledge-off-the-charts.